As the budget crisis forces deep cuts in state spending, and as economic pressures are driving more and more people from their jobs and their homes, the need could never be greater for a fully funded Massachusetts Legal Assistance Corporation (MLAC). That point was strongly made when over 800 lawyers from around Massachusetts filled the State House to lobby their state representatives and senators during the annual Walk to the Hill for Civil Legal Aid. The message was a simple one: Keep the funding for MLAC the same as last year, a total of $11,070.424. The budget allocation funds programs for general legal support, battered women’s legal assistance, disability benefits advocacy, and Medicare advocacy. These investments more than pay for themselves. The programs help unlock Federal funding for individuals entitled to disability and Medicare benefits. They help battered women when they are facing their deepest crises. And they help people with the full range of everyday problems, the greatest of which is staying in their apartments or house when they are facing improper eviction or foreclosure. In a word, the programs work. They are the proverbial “ounce of prevention” which save many millions more if people are unable to get medical care, benefits, or proper housing. Level funding for MLAC is a reasonable request, even in this year of fiscal restraint. Other programs which support MLAC, such as the Interest on Lawyers’ Trust Accounts (IOLTA) are providing less funding, due to the fact that interest rates are so low. Even with just level funding, MLAC will be forced to cut back some programs. The lawyers at Breakstone, White and Gluck strongly support the funding of MLAC. 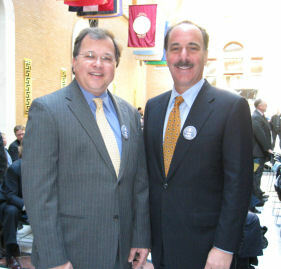 Present during the Walk to the Hill were attorneys Marc Breakstone and David White (pictured above), who paid visits to their state senators and representatives, all of whom pledged their support for civil legal aid. What You Can Do: Keep an eye on the budget this year. The Governor’s budget proposal is due out this week. Contact your state senator and state representative and ask him or her to support level funding for Massachusetts Legal Assistance Corporation in Fiscal Year 2010. For more information, complete the contact form on the right, or contact the organizations below.